In April 2016 Mitel acquired the mass notification product Blazecast from Benbria. 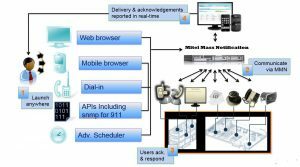 This product, which has been rebranded Mitel Mass Notification (MMN), is an intelligent next-generation notification system that enables faster delivery and acknowledgement of vital information across a wide range of channels and devices to key stakeholders and targeted groups. 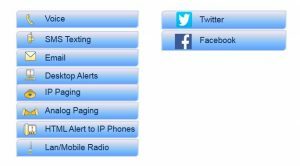 MMN is a modular notification system that communicates information simultaneously to thousands of recipients, or a specific group of people depending on the trigger incident, quickly and efficiently through all modern communications methods. MMN provides a single, unified notifications platform with centralized contact management, administration, broadcast controls and reporting. MMN provides an intuitive browser-based user interface that is accessible from any computer on the MMN network, as well as providing dial in capabilities. MMN is modular to meet current requirements with a future-proof path for upgrades and expansion. You can read about this solution, watch a video of a deployment at Texas A&M, and get more information on Mitel’s website. Recently I had the opportunity to present and demonstrate this solution to a customer, so had to complete the online training on Mitel’s Learning Management System and read the appropriate documentation. After completing this work I then reserved our virtual demonstration system for this product and proceeded to give it a whirl. I must say – this is a fantastic and easy to use solution, yet has powerful features that I did not even broach such as APIs and SNMP for triggering the multiple means of mass notifications. Unlimited HTML Notifications to Mitel 53xx series phones (5324, 5320, 5320e, 5330e, 5340e, and 5360). It is not yet available on the new 69xx series Mitel IP phones, but is expected in the first half of 2017. Recipients are able to acknowledge receiving the message directly from the phone via soft key. The HTML Notifications require the $0 part number (54004400 (50) or 54004891(5)) – HTML App License for each 53xx phone on the MiVoice Business Call Manager. Desktop Notification to 50 computers. SMS Notification to 50 recipients and 3000 messages. This is an annual renewal feature for both the function and the number of messages. Voice Port License – Every voice recipient (phone number) to be called requires 1 Voice Port License. Price breaks at quantity 250, 500, 1000. 2000, 5000, 10000, and 25000. Can be used to call and send a pre-recorded message to internal or PSTN connected phones or Page to individual or group of phones on the MiVoice Business call manager. Recipients interact with MMN via DTMF (pressing digits). Voice messages are saved for re-use. Email Notification License – Every email recipient to be stored requires 1 Email Notification License. Same price break quantities as the Voice Port License. Desktop Notification License – Every computer notification recipient to be stored requires 1 Desktop Notification License. Same price break quantities as the Voice Port License. SIP Paging License – For SIP devices registered directly with the MMN, versus the MiVoice Business call manager. Allows one SIP-based paging endpoint registration to the MMN system for paging the connected device or system. Example SIP-based paging endpoints include third-party IP speakers, SIP-to-Analog audio gateways, SIP IP speakers registering as a generic SIP endpoint, or other such devices that register directly with MMN. One exclusion – the Mitel Talkback Speakers do NOT require a license. Price breaks at quantity 250, 500, and 1000. Conference Port License – The number of licensed Conference Ports determines the maximum number of simultaneous participants in a conference. MMN includes its own conference bridge exclusive of the call manager or associated applications. SIP Connection License – These are the concurrent “paths” between MMN and the MiVoice Business Call Manager. In general, it should match the number of SIP Trunk Licenses on the MiVoice Business that are used for simultaneous connections to MMN. Price breaks at quantity 25 and 100. 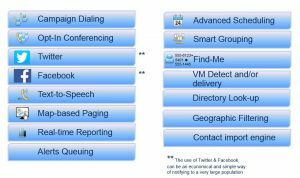 Campaign Dialing License – Each Campaign Dialing license enables a separate instance of the Auto Dialer. Multiple licenses reduce the length of time required to complete a Campaign. Price breaks at quantity 4, 8, and 15. Text to Speech (TTS) License – Allows users to directly translate text into a voice messages with MMN natural sounding voice. Used for general purpose paging or voice-dialing broadcasts. SMS License and Usage – the core software package includes the first year of service and 3000 messages for 50 recipients. This is an annual renewal for the service, and the number of messages can be increased from the base 3000 to many more. Sold in 3000, 10000, 50000, and 100000 bundles. Additionally, the base package 50 recipients can be expanded with price breaks at quantity 250, 500, 1000. 2000, 5000, 10000, and 25000. MMN is software that is delivered on an installation DVD or ISO file and can be installed on a physical server or installed as a virtualized VMware instance. The operating system is Ubuntu Linux (64-bit). 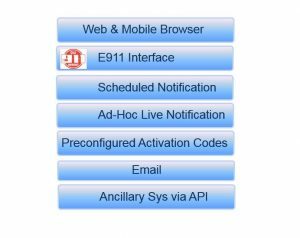 If you would like to learn more about Mitel Mass Notification and/or get a demonstration, please contact your Mitel Authorized Partner. And just maybe that will be one of the partners I work with so I have the opportunity to meet you in person.